There are some victims who have been sleeping in their cars, some whose houses have been completely destroyed and are anxious about the future, and some senior citizens in their nineties. Ten days have now passed since the earthquake hit, and the harsh evacuation conditions are continuing. Even the local government staff are becoming tired. 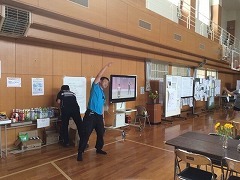 Thankfully, however, public health nurses from other areas in Japan have come to Atsumacho to offer their support. As relief efforts continue, it is ever-important to maintain communication between all involved parties. AMDA continues to act and plan further activities based on communications with the Hokkaido Prefectural Government, public health nurses and other various medical institutions that are involved. In order to better do this, AMDA has decided to dispatch a medical coordinator (a coordinator with a medical license). 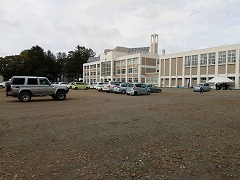 The medical coordinator departed from Okayama Airport on 16th September and will arrive at Shin-Chitose Airport before heading to Atsumacho via a rental car to join the AMDA team. The weather is becoming cooler in Atsumacho, with highs of 25°C in the afternoon and 20°C at night. According to Hokkaido Prefectural Government reports, as of 8:00am on 16th September, there is now a total of 1,445 evacuees living in 24 evacuation sites throughout 6 areas in Hokkaido. In Atsumacho, there are 98 evacuees recorded to be living in 7 evacuation sites.